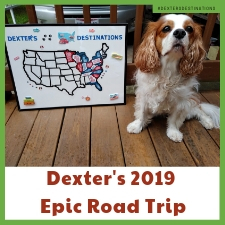 For me, there isn’t anything better than a dog-friendly vacation with my sidekick, Dexter The Dog, unless it’s a BEACH vacation with Dexter! Dexter and I were joined on this trip with our friends Chris and Levi The Dog. When deciding what dog-friendly vacation rental to choose, Chris was adamant about staying right on Myrtle Beach. Staying beach-side would be a new adventure for us, and Dexter was in with all four feet. We looked on www.vrbo.com, and found a great-looking end unit called Beauty and the Beach: one bedroom, queen sofa sleeper, and bath. 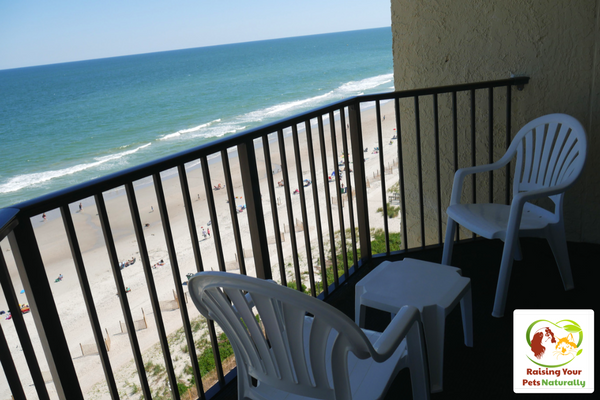 This unit wasn’t just on the beach—it had a direct oceanfront view with a balcony on the 10th floor. 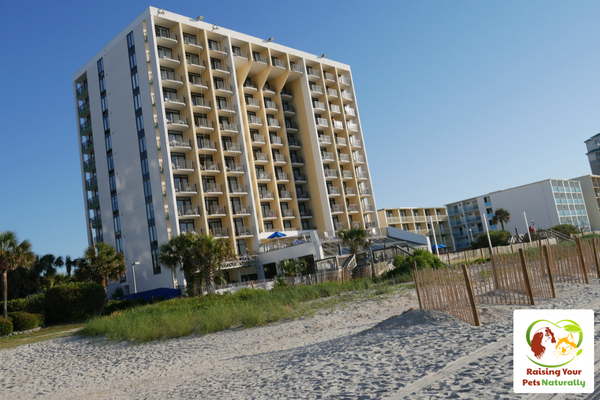 The condo was inside Ocean Park Resort, and the rental included Ocean Park’s amenities such as their fitness center, underground parking, heated indoor pool, outdoor pool and indoor/outdoor hot tub. Just FYI, these amenities are not dog-friendly. After emailing with the condo owners, I knew this would be the place for us to call home for a week. After booking our stay, Chris and I were on pins and needles waiting for our travel day. 🙂 When the time finally came and we arrived at our condo, we were so happy and thrilled with our choice. The first thing we all did, including the dogs was to open the balcony slider and look at the spectacular ocean view. Ah, we had made a great choice! 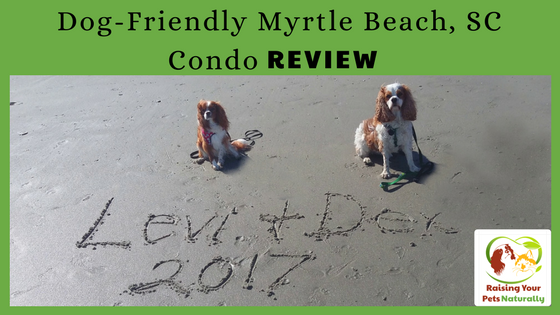 This dog-friendly oceanfront condo vacation home rental on Myrtle Beach was lovely! 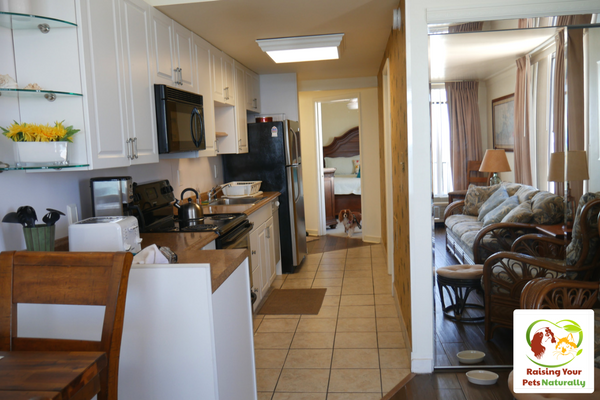 The unit was very spacious with large windows in the bedroom and living room, both of which had ocean views. The rental home also included a washer and dryer, two-person shower, brand new furniture, two TVs, DVD player, and new kitchen appliances. The kitchen was also fully stocked with utensils, cookware, plates, etc. Linens and housekeeping may or may not be included, depending on your package choice. There was a bit of confusion on this for us, and we received our linens late. During our stay, the beach was dog-friendly before 10 am and after 5 pm. You better believe that we spent those hours walking up and down the beach, frolicking in the water. The water was a perfect temperature for getting our toes wet. Yes, I’m a scaredy-cat when it comes to sharks, which were actually five miles down the beach INSHORE when we were vacationing. Our nights were great. The hotel resort was very quiet and we didn’t hear other guests. One night, we even saw dolphins from our balcony. That was such a great experience. We had a bit of a hiccup when checking out of our condo, due to some confusion about what services we paid for. Elliot Rental sent a checkout email stating we were to clean the unit (toilets, shower, dusting, etc. ), so we obliged. It ended up that we actually had paid a departure cleaning fee. I have been assured that this fee will be refunded via check (I paid with a check, not credit card). I received our security deposit refund 15 days after our stay ended. Even with the glitch, I would do it all over again. The four of us had a great week at our Myrtle Beach oceanfront vacation rental. This condo is truly a gem, and the views from our private balcony were breathtaking. We had a wonderful week with a lot of fun dog-friendly adventures during the day, and coming home to this condo was a blessing. I love how relaxed I felt hanging out on the balcony watching the tides come in. Is your dog a beach dog? Tell me in the comments. I love that more and more places are becoming pet friendly. It’s so much fun to bring out furry friends along. Me too. It’s not a vacation without my best bud, Dexter. I love pet-friendly places. I used to love taking my dog on our vacations. Now we have three dogs, which is way too many to travel with in addition to two young kids. It’s so much more challenging traveling with multiple pets and human kids. Beachside is always so nice. 🙂 It was so much fun. Yes, straight down to the beach for the sunrise. Amazing. Our friends are in Myrtle Beach right now. We have never been but they rave about it. That’s so neat! It’s a great spot, our second trip. I love that there are pet-friendly options like this. And the location of your condo looks amazing! It sounds like you had a nice vacation! I love the idea of travelling with your pets. It was a great vacation / workcation. I think it’s great to have pet friendly options. 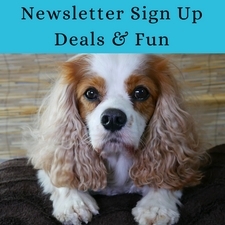 Your pets are part of your family and if you want to bring the whole family there should be an option! Totally agree with you, Tiffany. Dexter is my family. This sounds like the perfect place for you, Levi and Dexter! I love the name of the place you stayed too, “Beauty and the Beach”. My daughter literally just mentioned possibly vacationing there, although I don’t think she would consider taking our dog. 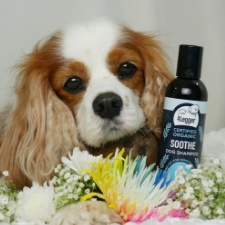 It’s wonderful to know there are lovely places to visit where your animals are welcome too! Thanks for the review and the tour! Thanks. It was such a blast. 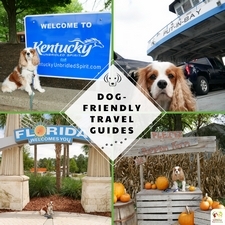 I’m looking forward to sharing some of our dog-friendly adventures during this trip. Oh, take the dog! Okay, this is beyond adorable! Doggy vacays? How fun is this. We visited Myrtle Beach when I was young and it’s such a great memory. So glad you enjoyed our trip! It’s the only way I travel and vacation. Awe. Not sure if they are cat-friendly, but the blogging conference I attended was~! Your condo was really nice. It’s also great that it’s pet-friendly to suit everyone. I’m going to look into this location when I visit in the future. Thanks for sharing! Sure thing! We were so happy. Thanks. They really are cuties. This would be so much fun to see! I love that it’s also dog friendly! Such a great family-friendly spot! A great family condo. We saw lots of kids. 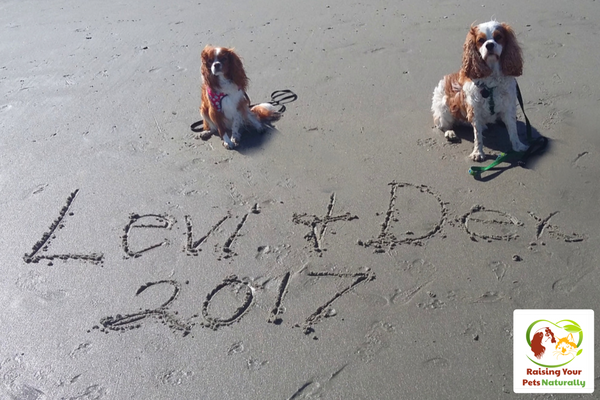 Dex and Levi were happy, they love the little ones. I love condo renting for vacations. So much nicer than just a hotel room. For me it saves me a lot of money and I can chose to prepare my own meal. Great points. It was nice having a full kitchen. Saves lots of money. Thanks, Emily. For sure. I can’t imagine leaving Dexter behind. He loves his vacations. 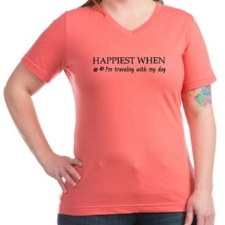 I adore my dog but haven’t ever thought about taking her on vacation! These are some great spots and a great idea! If he’s friendly, you should! It’s so much fun to travel with dogs. I remember when it was hard to find a pet friendly complex so this is good news. More and more residential communities allow them based on type of animal, weight and training…. 🙂 It’s so important that when we take our pets with us, that we are very appropriate, not noisy, clean up after our pets etc. Then, we can continue to open doors for pets. 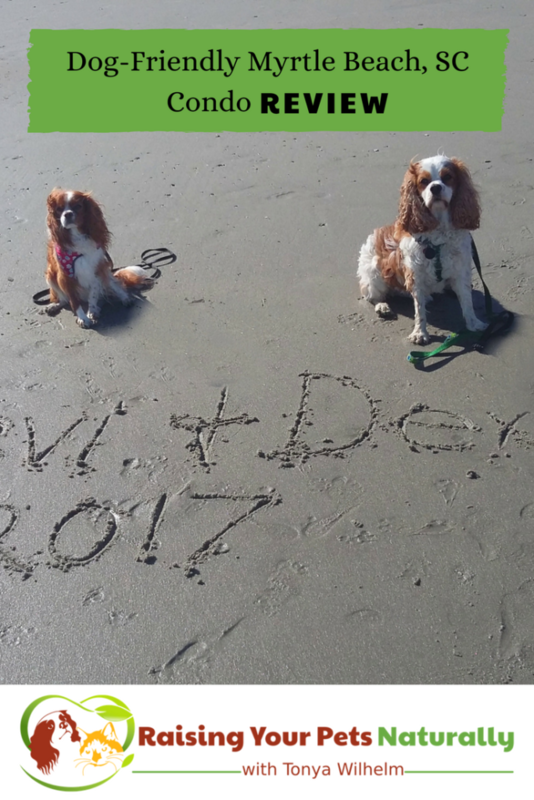 I love how Dex got a friend to play with him on this vacation and Myrtle sounds like the perfect rental as well! I love how your trusty sidekick goes with you everywhere! Oh wow! I hope we have more beaches like that here in the Philippines. Slowly malls are becoming receptive to being dog friendly hope other establishments will follow suit. I love that the malls are becoming dog-friendly. That is awesome! I’m not a pet person but I like the idea of beaches being dog friendly. More and more people are bringing their pets with them everywhere. One day they just might be going to work too! Oh, they do join a lot of people at work. Some companies it’s an option year-round, others have a specific day a year. Sorry for your loss. I love that she headed for the beach and rolled around. How fun! i am not a pet owner but i totally get what a relief it is to find pet friendly beaches! Dog-friendly beaches are the best! I need to find something like this in a around Cape Town. I hate having to leave Sparrow with her aunt or gran when we go on a break. Oh, that sounds like a fun trip!